There are a whole range of remarkably cold hardy oriental greens. They are ideal to keep your plot going through the depths of winter, particularly if you don't have the space or time for traditional winter veg like brussels. 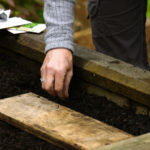 Many are good both in salads and cooked - try Pak Choi, Mizuna, Chinese Cabbage, Mibuna, Tatsoi and Mispoona, all of which can be sown from the end of June through to end September (you can keep on sowing through into the winter if you have a polytunnel on you raised bed to). Choi Sum (Brassica parachinensis) is a member of the Mustard family is also referred to as a flowering pak choy or choy sum. Its green leaves are juicy and tender. If allowed to mature and bolt, yellow flowers will shoot and the plant becomes sweeter and more succulent. The whole plant is edible, which is why we are such a fan!